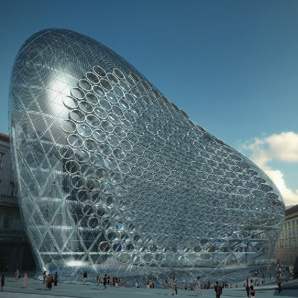 Zaha Hadid has designed a landmark building for Szervita Square in the historic centre of Budapest, Hungary (via www.hg.hu). The mixed-use building, for ORCO Property Group, will replace a communist-era car park and will contain shops, restaurants, offices and a nightclub. Hungarian site www.hg.hu has more details of the project here. Orco Property Group is an Eastern European property developer that is also behind the Zlota 44 residential tower in Warsaw by Daniel Libeskind.